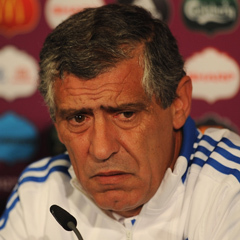 Gdansk - Greece coach Fernando Santos will devise his tactical masterplan to upset Germany in the quarter-finals of Euro 2012 in a cloud of smoke after stating on Thursday that he thinks clearer when puffing away on a cigarette. Answering questions at a news conference at Gdansk's stadium the day before Greece try to claim a first ever victory over Germany, Santos was quizzed over his habit by German reporters. Asked if the players were concerned by his smoking, Santos said it was not really their concern. "I smoke because I like it, when I stop liking it I'll quit," the 57-year-old Portuguese said. "Maybe because I think about the tactics so much is the reason I smoke. I have to try to find the right options and tactics and when I smoke I have more time to reflect. "So now, you maybe understand why I smoke so much." Greece qualified for the tournament undefeated but are still the surprise package of the last eight, having knocked out much-fancied Russia in their final Group A match. They will also be without suspended skipper Giorgos Karagounis, who equalled Theodoros Zagorakis's record of 120 caps in the match against Russia. However, Santos said his well-organised but low-scoring side were taking inspiration from the 2004 squad which won the European title under German coach Otto Rehhagel in Portugal and he believed his team could emulate them. "Like the other seven coaches left, they will all have imagined winning the final," he said. "I'm the same, if I hadn't I may as well quit and go fishing. "Of course we are well aware of the quality Germany have, they are favourites not just for this game but one of the favourites for the title. "But if you remember I said we hadn't just come here for a vacation and I still say that. I'm waiting for a great game tomorrow. In knockout football anything can happen. "Every game is a final now. "If you want to compare it to David and Goliath then I'm happy to play the David because we all know he won." Fanis Gekas, who scored his 22nd goal for his country in the 2-1 group phase defeat by the Czechs, said they would miss the influence of Karagounis - scorer of the goal against Russia that propelled Greece into the last eight. The winners of Friday's match will face Italy or England in the semi-finals.